When I sipped French Vanilla this morning, I was surprised. I’ve drunk this tea in the past, of course, but it’s only been lately that I’ve really expanded and start to analyze the taste of a tea. Compared to Queen Mary’s Coconut and Strawberry Pepper, there was a distinct smoothness about the cup. So for the first time I examined, rather than glanced at, the ingredients. China black tea. Whereas Coconut and Strawberry only specified “black tea”. I looked at the rest of my Queen Maty teas, and discovered that my favorites—Creamy Earl Grey and Lady Grey—were also China black teas. What’s the difference? you may ask. There are actually two main branches of the tea family that are commonly used to make black tea: a Chinese variety, and the so-called Assamese variety. They actually do differ on taste, but one isn’t naturally better than the other. However, the smaller leaves of China black are much less prone to breaking, whereas the larger leaves of Assamese are. I think the result is that China black teas will more often taste better than the often more broken Assamese. This is all a long way of saying: French Vanilla is great. The vanilla is more subtle than that of Harney & Sons’ Vanilla, as well as Mighty Leaf’s Vanilla Bean, but that quality befits a French vanilla taste. 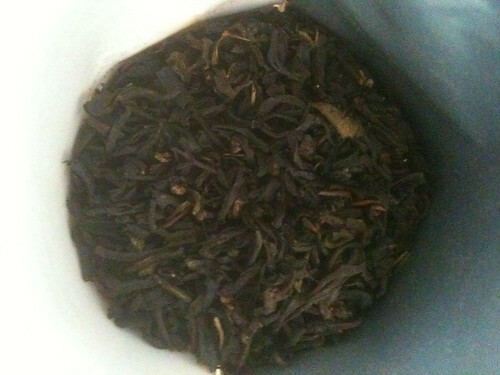 And the background of smooth China black tea means the taste is nice and full. Rating: 4/5—a more subtle yet working vanilla tea is always welcome in the cabinet.